Cats are renowned for sleeping for very long hours, however, in the moments they aren’t asleep, they tend to be extremely active. These activity periods tend to happen more at night. If a cat tried to wake its owner up after he/she has turned in for the night, it could be because the cat wants to eat, play or just wants to enjoy its owner’s company. Kittens below a year are particularly renowned for waking their owners up to play, which can cause sleep deprivation. A way to properly understand this is considering that, cats have the same nocturnal trait as their early ancestors, which is the African Wildcat. Over hundreds of years, domestication has switched the activity pattern of pet cats to be a bit more diurnal, making them awake most of the day, however, the majority of cats are more likely to wake up at least two times for the duration of the night. That being said, cats are able to learn new behaviors that would ensure their owners have a night’s rest that isn’t disturbed. 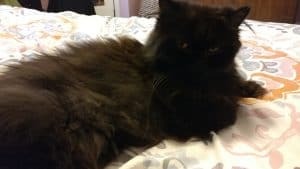 In this article, we shall be taking a look at how to get your cat to sleep at night as well as some possible reasons it is staying awake in the first place. Why exactly do certain cats become more active during the night? There are a couple theories to this, but the prevailing theory is that, since most owners are at school, work or generally out of the house during the day, the cat would be inclined to spend the majority of the day relaxing and resting, especially if it is the sole pet in the home. To a cat as such, the day only begins when its family members arrive to provide, companionship, food, social interaction and play. Should the cat wander restlessly all over the house in the nighttime crying or meowing, it could be in pain from discomfort caused by an undiscovered medical problem. In the event that this is the case, it is best to take that cat to see a veterinarian, so the veterinarian can rule out any physiological or neurological issue. Make time for a couple play sessions that are extremely interactive. It is best to set these in the evening time. You can make use of toys that are able to imitate the movements of birds and mice, like toys that wiggle and dangle. Games that involve softballs, furry mice and ping pong balls are wonderful for cats that love to fetch. Tire put your cat by playing with it. It’s best to feed a major meal to the cat, right before you head to bed. Should the cat continue to attempt to wake you up at night for more food, it is best to buy a timed feeder which can be filled and adjusted to dispense food, once or two times at night. Should the cat be hungry, it will learn to stay by the feeder waiting, instead of bothering you while you sleep. When doing this, it is best to decrease meal portions, so the cat does not gain weight. Adding a large range of activities that enrich and ensures your cat remains busy during the day. The more time your cat spends being active during the daytime, the higher the likelihood it will sleep during the night. If the cat in question has been socialized, it can be a good decision to give it a playmate by introducing another cat to the household. This is because a solitary cat could seamlessly become bored being home alone during the day, which will cause it to expect attention from its human at night. Another cat is able to provide companionship in the daytime and will reduce the nocturnal urges your cat has to wake you up for play. This can be even more so with kittens, as they tend to have a lot more surplus energy to get rid of during their initial year of life. It can be said that two kittens can be better than just one. When the two felines are compatible, they will be most likely play with one another and let you be for the night. That being said, playing cats can get rowdy and make quite a bit of noise, which could interrupt your sleep. Playful felines could accidentally injure their owners while they sleep. For example, the cat might notice rapid eye movement made under the lids while their owners sleep, and then proceed to play with it by swatting their human’s face. Should your cat attempt to play with you or try to wake you up, it might be best to lock that cat out of the room for the night. If the cat scratches or cries at the door in an attempt to get back in, it might be necessary to discourage it by placing something in front of the door, which the cat would prefer not to step on, such as the underside of a carpet runner made of vinyl; this helps to have the knobby parts exposed, double sided tape, or aluminum foil. Alternatively, booby traps can be set just outside the door. This can be done by placing a blow dryer on the bedroom doorknob or positioning a vacuum cleaner a couple of feet away from the door. You can connect the vacuum cleaner or dryer to a remote switch. When the cat attempts to get in the room by meowing or crying outside the door, you can use the remote switch to turn on the chosen booby trap appliance. This event startles the cat and it probably wouldn’t come back to that door. In the event that you, a cat owner already has a sleeping disorder, it is advisable and imperative that your cat is not encouraged to sleep or be on your bed. This entails making the bedroom a no-go zone at all hours. It is best to give your cat a cat bed that is not only comfortable but inviting in either a corner in the living room, a supplementary room or perhaps the bathroom. It might be necessary that a little bit of catnip will have to be rubbed on the bed at first, in a bid to encourage its use by the cat. In the event that your cat only bothers you by launching biting, pouncing attacks on your toes, it is best to make use of darkroom shades that totally darken the bedroom. Any and all fluorescent or digital dial clocks positioned by the bedside should be replaced with versions that are non-illuminated. While cats are able to see in the extremely low light, they are unable to see in complete pitch darkness. The cats might also be encouraged to fall asleep by this lack of light. 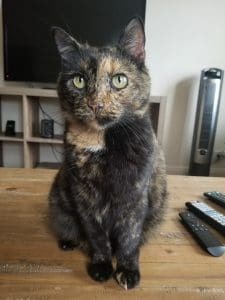 Altering the cat’s behavior might be an owner’s initial course of action, however, living with and owning a cat is something that requires a bit of compromise. Changes to play schedule might take a while and require patients, so it is possible that some of your habits as an owner have to change as well. Fix the mood and tone of the bedroom, by keeping it free of cat toys. This ensures your cat knows that the bedroom falls under a no play area. It is true that cats can suddenly decide that paper scraps and rolled up socks are fun toys, so it is best to keep all potential toys hidden as well. It is important to shut the bedroom door and keep it closed for the remainder of the night while you sleep. A sound machine, fan or white noise machine can be used to cancel out any outside noise should you be a light sleeper. Label a section or a room that is far enough from the bedroom as a play zone, so you don’t hear much commotion while you sleep. Since being nocturnal and engaging in night activities is natural for cats, it could take a bit of time for some cats to fully adjust while others are seemingly ready to rapidly alter their habits. It is important to be completely patient with your cat as that would ensure you both are much happier later on. Except you believe your cat is attempting to wake you up because it is either sick or hurt, it is best not to get out of the bed in a bid to attend to it. Should you wake up to feed the cat, interact or even play with it, you would be accidentally encouraging and rewarding it for waking you up. This could then result in it trying even harder every following night to wake you up. It is important that you do not get out of bed to reprimand it, as that would have the adverse effect, making it think receiving negative attention is better than getting no attention. The best thing that can be done is to fully ignore the cat. Typically, after 10 days, the cat becomes tired of this charade and stops disturbing you. Likewise, should your cat begin waking you because it is searching for food a bit too early, it is best if you as an owner, adopt a similar feline psychological approach? This is done by ensuring you take as long as you need to get up, have some breakfast and possibly put some new clothes on, before attending to the cat. This way, the cat begins to understand that there really is no purpose in waking you up early in an attempt to get fed. In the event that the cat continues to interrupt you while you sleep, it might be time to consider restricting the cat’s access to the bedroom. This is done by ensuring it has access to a sleeping area that is not only comfortable but comes complete with a litter tray and water. Should the cat remain up and continues to prevent you from sleeping, you can offer sufficient opportunity for play, climbing and scratching. Ultimately, it will become tired and eventually go to sleep. Cats that are typically vocal after having been locked out of a room they desire access to, should be ignored. Attending to the cat or giving it attention in any shape or form will only reward and reinforce that demanding behavior. Should you cat be excessively vocal, you could try to relocate it in an area that is soundproof such as the laundry room or a bathroom. Sleeping outside the bedroom is not available as an option, what next? It is imperative to keep in mind that any form of attention given to your cat at night will do nothing but further reinforce that behavior. It is categorically vital that you don’t offer any form of attention, or affection to your cat. It is also important that you don’t attempt to calm it down. Should this behavior persist or your cat continues to a point where the behavior can’t be ignored, it is best to attempt making use of a deterrent. Using something like an air horn, a water sprayer or making loud sudden noises that can startle and rapidly deter the cat once they begin to exhibit behavior that is inappropriate. It is best to use this method only as an out-and-out last resort. Is there medication available that could help? In the event that every other attempt to curb this behavior with these behavioral techniques fail and your cat is unable to fall asleep for the night, there is some medication that can be made available to help the cat fall completely asleep for the initial nights. This helps to develop a routine. It is imperative to have a word with a veterinarian first before commencing medication to help your cat sleep. If you have a cat that refuses to sleep at night, we hope that the information above can help you in dealing with this potentially stressful situation. PreviousPrevious post:Do I Need to Give My Cat BathsNextNext post:Why Do Cats Follow Us Into the Bathroom?